Western blot analysis of extracts from HepG2 and 293 cells using Frizzled5 (D2H2) RmAb. 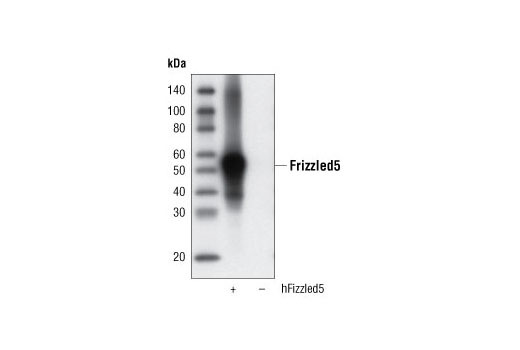 Western blot analysis of extracts from COS cells, mock transfected or transfected with human Frizzled5, using Frizzled5 (D2H2) RmAb. 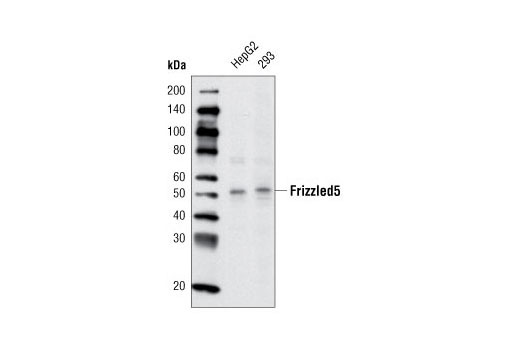 Frizzled5 (D2H2) Rabbit mAb detects endogenous levels of total Frizzled5 protein. Monoclonal antibody is produced by immunizing animals with a synthetic peptide corresponding to residues surrounding Pro160 of human Frizzled5 protein. Frizzled (Fzd) belongs to the seven transmembrane-spanning G-protein-coupled receptor (GPCR) superfamily (1). Fzds have a large extracellular N-terminal region containing a cysteine-rich domain (CRD), which is involved in binding to Wnt proteins (1,2). The intracellular C-terminus binds to the PDZ domain of Dvl proteins, a major signaling component downstream of Fzd (3). Wnt proteins bind to Fzd and the co-receptors LRP5 or LPR6, and activate Wnt/β-catenin pathway through inhibiting phosphorylation of β-catenin by GSK3-β (4,5). In addition to this canonical Wnt/β-catenin pathway, some Wnt proteins can also activate the Fzd/Ca2+ pathway and Fzd/PCP (planar cell polarity) pathway (6,7). The mammalian Fzd subfamily has 10 members (Fzd1 to Fzd10) and they may mediate signaling through different pathways (8). Some Fzds can also bind to other secreted proteins, like Norrin and R-Spondin (9-11). Schulte, G. and Bryja, V. (2007) Trends Pharmacol Sci 28, 518-25. Hsieh, J.C. et al. (1999) Proc Natl Acad Sci USA 96, 3546-51. Wong, H.C. et al. (2003) Mol Cell 12, 1251-60. Zeng, X. et al. (2005) Nature 438, 873-877. Davidson, G. et al. (2005) Nature 438, 867-872. Fanto, M. and McNeill, H. (2004) J Cell Sci 117, 527-33. Kohn, A.D. and Moon, R.T. Cell Calcium 38, 439-46. Cadigan, K.M. and Liu, Y.I. (2006) J Cell Sci 119, 395-402. Xu, Q. et al. (2004) Cell 116, 883-95. Nam, J.S. et al. (2006) J Biol Chem 281, 13247-57. Hendrickx, M. and Leyns, L. (2008) Dev Growth Differ 50, 229-43.